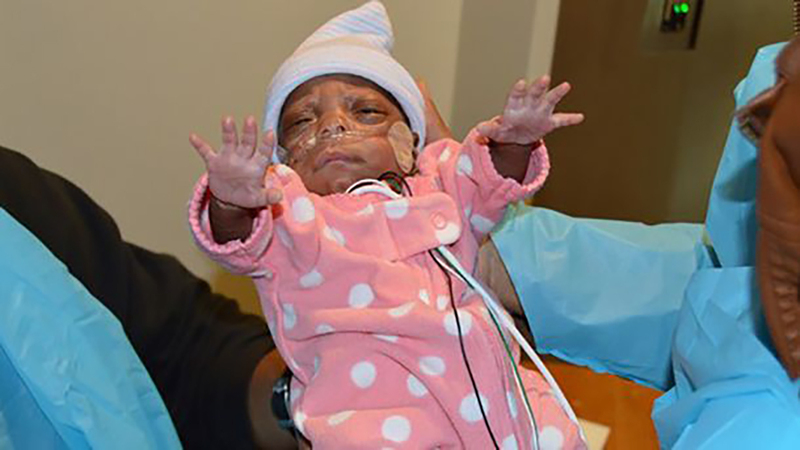 CHARLOTTE, NC -- E'layah Faith was born weighing just 10 ounces, making her the smallest surviving baby ever born at Carolinas Medical Center in Charlotte. She was born on Sept. 29, 14 weeks premature. On Tuesday, E'layah celebrated her original due date, weighing about five times as much as when she was born. Andrew Herman, MD, is the chief medical officer at Levine Children's Hospital. He said the medical team's goal was to help E'layah grow as quickly and as safely and they could. The team developed a unique combination of formula and breast milk to keep E'layah growing and healthy. WSOC reports E'layah's parents did not have an easy pregnancy. Megan Smith and Eric Pegeus learned E'layah was no longer growing in August. They were warned their baby girl might not survive. During E'layah's first two weeks, she received blood transfusions and began gaining weight slowly. The baby girl now weighs 3 pounds, and she is thriving. Though she is still at the hospital, her parents are able to feed her and spend time with her.